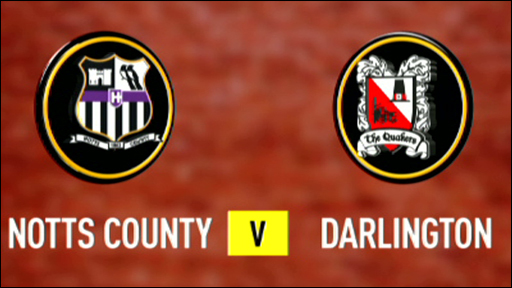 Lee Hughes scored twice as Notts County piled more misery on lowly Darlington. Luke Rodgers capitalised on some poor goalkeeping by debutant Ashlee Jones to open the scoring from close range. The hosts then doubled their lead when Hughes headed in a Craig Westcarr cross although Darlington's Mor Diop did force Kasper Schmeichel into a save. Davies finished off a slick County breakaway to make it three before Hughes lobbed a superb fourth late on and sealed a hugely comfortable win. County have now scored 26 goals at Meadow Lane this season and move up to sixth in the table but Darlington remain rooted to the bottom of the league. "The first 20 to 25 minutes we were brilliant. "But it is typical when you are two or three up that you sometimes go down a bit. "Overall in the second half I think we showed we are rather a good team." 92:26 The final whistle is blown by the referee. 90:00+1:58 Effort on goal by Jonathan Hogg from inside the area goes harmlessly over the bar. 90:00+1:40 Lee Hughes takes a shot. Save by Ashlee Jones. 90:00+1:12 Josh Gray gives away a free kick for an unfair challenge on Richard Ravenhill. Free kick taken by Kasper Schmeichel. 89:58 Ben Davies fires a strike on goal direct from the free kick. 89:58 Booking Danny Hall receives a yellow card. 89:53 Danny Hall gives away a free kick for an unfair challenge on Lee Hughes. 87:32 Outswinging corner taken by Josh Gray from the left by-line, Danny Hall takes a shot. Save by Kasper Schmeichel. 86:00 Josh Gray takes a shot. Save by Kasper Schmeichel. 85:00 Kasper Schmeichel takes the free kick. 85:00 Substitution Matt Ritchie goes off and Nathan Fox comes on. 85:00 James Collins is ruled offside. 84:36 The referee blows for offside against Lee Hughes. Jonathan Hogg takes the free kick. 83:55 Graeme Lee concedes a free kick for a foul on James Collins. Direct free kick taken by Jonathan Hogg. 83:19 The ball is delivered by Ben Davies. 82:40 Karl Hawley takes a shot. Save made by Ashlee Jones. 82:12 The ball is swung over by Lee Hughes, Danny Groves manages to make a clearance. 80:36 Kasper Schmeichel restarts play with the free kick. 80:36 Booking Lee Thorpe booked for unsporting behaviour. 80:00 Lee Thorpe concedes a free kick for a foul on Graeme Lee. 78:39 Matthew Hamshaw provided the assist for the goal. 78:39 GOAL - Lee Hughes:Notts County 4 - 0 Darlington Lee Hughes finds the net with a goal from the edge of the area to the top left corner of the goal. Notts County 4-0 Darlington. 78:10 Matt Ritchie takes a shot from 35 yards and went wide of the left-hand upright. 77:22 The official flags Karl Hawley offside. Ashlee Jones takes the free kick. 76:43 The ball is crossed by Lee Thorpe. 76:04 Corner taken right-footed by Matthew Hamshaw, Ian Miller makes a clearance. 75:01 Inswinging corner taken by Ben Davies. 74:53 The ball is crossed by Matthew Hamshaw, clearance made by Danny Groves. 74:37 The ball is crossed by Jamie Clapham, clearance by Stuart Giddings. 73:23 Shot from deep inside the area by Karl Hawley clears the crossbar. 72:57 The assistant referee signals for offside against Lee Thorpe. Indirect free kick taken by Graeme Lee. 69:28 The ball is swung over by Lee Hughes, clearance made by Danny Hall. 68:19 Substitution Matthew Hamshaw on for Craig Westcarr. 66:23 Josh Gray is flagged offside by the assistant referee. Indirect free kick taken by Kasper Schmeichel. 65:15 Corner taken right-footed by Ben Davies to the near post, Josh Gray makes a clearance. 65:03 Craig Westcarr crosses the ball, clearance by Stuart Giddings. 64:34 Jeff Smith takes the inswinging corner, Richard Ravenhill manages to make a clearance. 64:27 James Collins delivers the ball, Graeme Lee makes a clearance. 63:40 Paul Harsley takes a shot. Save by Kasper Schmeichel. 63:08 Josh Gray takes a short corner. 62:46 Outswinging corner taken left-footed by Josh Gray played to the near post, clearance by Richard Ravenhill. 61:57 Free kick taken by Ashlee Jones. 61:57 Substitution Karl Hawley replaces Luke Rodgers. 61:57 The assistant referee flags for offside against Luke Rodgers. 61:18 Jeff Smith takes a shot. Save by Kasper Schmeichel. 60:21 Foul by Richard Ravenhill on Paul Harsley, free kick awarded. Danny Groves restarts play with the free kick. 59:30 Outswinging corner taken by Ben Davies, Headed effort from close range by Lee Hughes goes wide left of the target. 59:15 Lee Hughes takes a shot. Ashlee Jones makes a save. 58:32 The ball is delivered by Danny Groves, clearance made by John Thompson. 57:40 Brendan Moloney takes a shot. Blocked by Ian Miller. 56:23 The ball is crossed by Jamie Clapham, clearance by Stuart Giddings. 55:06 Substitution Lee Thorpe joins the action as a substitute, replacing Mor Diop. 55:06 Substitution Josh Gray on for Simon Thomas. 54:17 Graeme Lee concedes a free kick for a foul on James Collins. James Collins restarts play with the free kick. 53:09 Ben Davies produces a left-footed shot from just outside the penalty box that goes wide left of the target. 51:25 The ball is crossed by Mor Diop, clearance by Graeme Lee. 51:13 The ball is sent over by Danny Groves, Graeme Lee makes a clearance. 49:52 A cross is delivered by Jeff Smith, Close range header by Danny Hall goes wide of the left-hand upright. 49:26 Jeff Smith takes a inswinging corner from the right by-line to the near post, Richard Ravenhill makes a clearance. 48:51 Jonathan Hogg has an effort at goal and missed to the right of the target. 47:32 The referee blows for offside. Ashlee Jones takes the free kick. 47:12 Ben Davies fouled by Jonathan Hogg, the ref awards a free kick. Direct free kick taken by Ben Davies. 46:38 The assistant referee flags for offside against Luke Rodgers. Ashlee Jones takes the free kick. 45:20 James Collins is ruled offside. Indirect free kick taken by Kasper Schmeichel. 45:00+1:11 Jamie Clapham delivers the ball, clearance made by Stuart Giddings. 45:00+0:52 Free kick awarded for an unfair challenge on Brendan Moloney by James Collins. Direct free kick taken by Kasper Schmeichel. 45:00+0:16 Inswinging corner taken by Jeff Smith, Lee Hughes makes a clearance. 45:00+0:02 Mor Diop takes a shot. Save made by Kasper Schmeichel. 44:14 Free kick awarded for a foul by Simon Thomas on Jamie Clapham. Jamie Clapham takes the free kick. 42:31 The ball is delivered by Simon Thomas, Headed effort from close range by Jonathan Hogg goes wide left of the target. 42:09 Simon Thomas produces a cross. 41:03 Jeff Smith crosses the ball, clearance by John Thompson. 40:00 Craig Westcarr produces a cross, Headed effort from deep inside the area by Lee Hughes misses to the left of the goal. 39:16 The referee blows for offside. Free kick taken by Kasper Schmeichel. 37:21 Craig Westcarr takes a shot from 35 yards and went wide of the right-hand post. 35:46 Matt Ritchie produces a cross. 34:07 The ball is swung over by Luke Rodgers, clearance by Ian Miller. 33:08 The assistant referee flags for offside against Simon Thomas. Indirect free kick taken by Kasper Schmeichel. 33:02 The ball is swung over by Jonathan Hogg. 32:28 Corner from the left by-line taken by Jeff Smith, clearance by Lee Hughes. 32:23 The ball is crossed by Stuart Giddings, blocked by Ben Davies. 31:07 The assistant referee flags for offside against James Collins. Jamie Clapham takes the direct free kick. 29:29 A cross is delivered by Paul Harsley, Kasper Schmeichel makes a comfortable save. 28:46 Brendan Moloney challenges James Collins unfairly and gives away a free kick. Jeff Smith delivers the ball from the free kick left-footed from left wing, clearance by Graeme Lee. 28:35 A cross is delivered by James Collins, clearance by John Thompson. 27:51 Inswinging corner taken by Jeff Smith, clearance by Ben Davies. 27:31 The ball is sent over by Brendan Moloney, Jonathan Hogg manages to make a clearance. 26:31 Simon Thomas delivers the ball. 21:15 Jeff Smith crosses the ball in from the free kick, clearance made by Graeme Lee. 21:15 Booking John Thompson goes into the book for unsporting behaviour. 20:16 John Thompson challenges James Collins unfairly and gives away a free kick. 19:11 The ball is delivered by Brendan Moloney. 16:44 Luke Rodgers provided the assist for the goal. 16:44 GOAL - Ben Davies:Notts County 3 - 0 Darlington Ben Davies grabs a goal from close in to the bottom right corner of the goal. Notts County 3-0 Darlington. 16:02 Unfair challenge on James Collins by Ben Davies results in a free kick. Free kick crossed left-footed by Jeff Smith, Graeme Lee makes a clearance. 15:04 Matt Ritchie produces a left-footed shot from just outside the area that goes wide left of the goal. 14:44 Corner from the right by-line taken by Ben Davies, clearance made by Jeff Smith. 14:39 A cross is delivered by Ben Davies, blocked by Simon Thomas. 14:14 Ben Davies takes a short corner. 14:08 The ball is delivered by Luke Rodgers, blocked by Danny Hall. 13:03 Assist by Craig Westcarr. 13:03 GOAL - Lee Hughes:Notts County 2 - 0 Darlington Lee Hughes scores a headed goal from inside the six-yard box. Notts County 2-0 Darlington. 11:59 Assist by Lee Hughes. 11:59 GOAL - Luke Rodgers:Notts County 1 - 0 Darlington A goal is scored by Luke Rodgers from close range to the bottom right corner of the goal. Notts County 1-0 Darlington. 11:42 Mor Diop takes a shot. Save made by Kasper Schmeichel. 8:24 Free kick awarded for a foul by Jonathan Hogg on Ben Davies. Ben Davies has an effort direct from the free kick. 7:02 The ball is sent over by Mor Diop. 5:31 Brendan Moloney produces a left-footed shot from outside the box and misses left. 5:06 Centre by Mor Diop, Graeme Lee makes a clearance. 3:06 The ball is swung over by Craig Westcarr, clearance by Danny Hall. 2:27 The referee blows for offside against Luke Rodgers. Ashlee Jones takes the free kick.